To Sum It Up: Stepping into his new role as Alpha of London’s werewolf pack, Biffy knows that he’s about to face many challenges ahead, including convincing the rest of his pack to accept his choice of color for the drawing room curtains. There’s also a mystery to solve when human babies start turning up on the doorstep of the pack’s new home. Complicating Biffy’s life most of all, though, is the return of Professor Lyall, the pack’s Beta, after a long absence. Both wonder where things stand between them now, and whether or not rekindling their past is in their future. Review: I’ve been caught in the clutches of a horrific reading slump for the past few months, but reading the absolutely delightful Romancing the Werewolf reminded me all over again why I love reading. I look forward to every new release from Gail Carriger, but I was especially eager to read Romancing the Werewolf. The novella features werewolves Biffy and Lyall, two of my favorite characters from Carriger’s supernatural/Victorian steampunk world of her Parasol Protectorate and Finishing School series. Everyone who’s been waiting to find out what happens to Biffy and Lyall post-Timeless will not be disappointed here. It’s been twenty years since Professor Randolph Lyall, Beta of the London Pack, departed England to make amends with another pack. Now he’s returned to resume his previous duties but under the leadership of a different Alpha—Biffy. Biffy, a former vampire drone who once harbored hopes of becoming a vampire himself but instead wound up a werewolf. Not only did he not join the supernatural set in the manner he’d wished, but now he’s a pack leader. Biffy also differs from his predecessor, Lord Maccon, in just about every respect: in stature, in temperament, and most certainly in decibel level. Biffy is struggling to find his footing as Alpha and doubts his ability to lead, but fortunately, Lyall has always excelled in his role as Beta and at smoothing over any troubles within the pack. 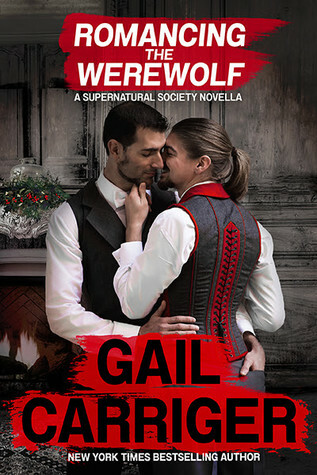 While the novella’s heart lies in the question of whether or not the two werewolves will reconnect with each other, there’s also a mystery to solve involving abandoned babies, as well as plenty of the signature hilarity that makes the Parasolverse so much fun to visit every single time. The humor in the books and novellas just clicks with me, and I highlighted several chuckle-inducing quotes from Romancing the Werewolf on my Kindle so I could go back later and laugh out loud all over again. Don’t let the novella length of Romancing the Werewolf fool you: there’s a sweet, wonderfully developed story here, along with some lovably quirky characters, lots of witty dialogue, and tea. This novella was everything that I’d hoped it would be—simply perfect from beginning to end. I’ve been loving these Parasolverse stories, and as long as Gail Carriger keeps writing them, I’ll absolutely keep reading them. All in All: I couldn’t put this down! With the Biffy/Lyall focus, Romancing the Werewolf made this Parasolverse fan extremely happy. Please note, though, that you can read this without having read any other novels or novellas set in this world. If you’re new to the Parasolverse, Romancing the Werewolf is an excellent place to start!